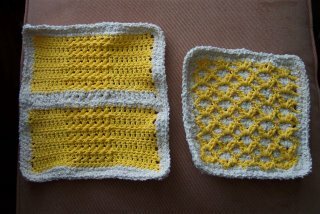 This is a nice set of washcloths I made. They went each to a different person, they loved the material and the combination. The one on the left ios about 9" tal, so it is a nice size for a washcloth. The one on the right has a scrubby cotton feeling to it as the yarn provides extra surface area for washing. I have been thingk about dishcloths and I will make dishcloths very simple an just one color. I have found that you can easily interexchange the patterns and have great outcomes on both. I am making them very fast as I watch one of my favorite TV channels, The Sci-Fi channel. I think discloths should be very simple for what they are going to used and become. Well if you just want them for decorations then you can go fancy, LOL, otherwise a two color dischloth on a single stitch should suffice, but who are we to say that we can not have fancy dishcloths. Fine I guess we will make them fancy as well. Anyway Thanks for stopping by, either tomorrow of Wednesday I will have an object from the Mystery Pattern that you will love. Were you watching Dr. Who?